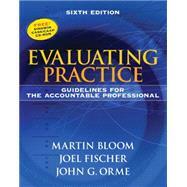 by Bloom, Martin; Fischer, Joel; Orme, John G.
Evaluating Practice Sixth Edition continues to be the most comprehensive practice evaluation text available. Focusing on single-system designs,Evaluating Practice,6/epresents clear guidelines on conceptualizing and measuring problems, developing practice-oriented evaluation designs, understanding and analyzing data, and ethical guidelines for practice evaluation. It is specifically written for students and practitioners in all the human services, including social work, psychology, counseling, nursing and psychiatry. Unsurpassed among human service evaluation texts for bringing clarity to evaluation procedures,Evaluating Practicecomes with a free CD-ROM featuring numerous programs, including the innovative SINGWIN program for analyzing data (created by Charles Auerbach, David Schnall, and Heidi Heft Laporte of Lehman College of the City University of New York, the CASS and CAAP programs (created by Walter Hudson) for managing cases and scoring scales and Microsoftcopy; Excel workbooks and interactive exercises.